Oven-bakes and casseroles of any kind are a super easy way to feed hungry hordes. They’re fantastically comforting to tuck into too, even more so when they happen to be covered in loads of gooey, melted grilled cheese. This mince and hash bake was a hands-down dinner winner the first time I dished it up. 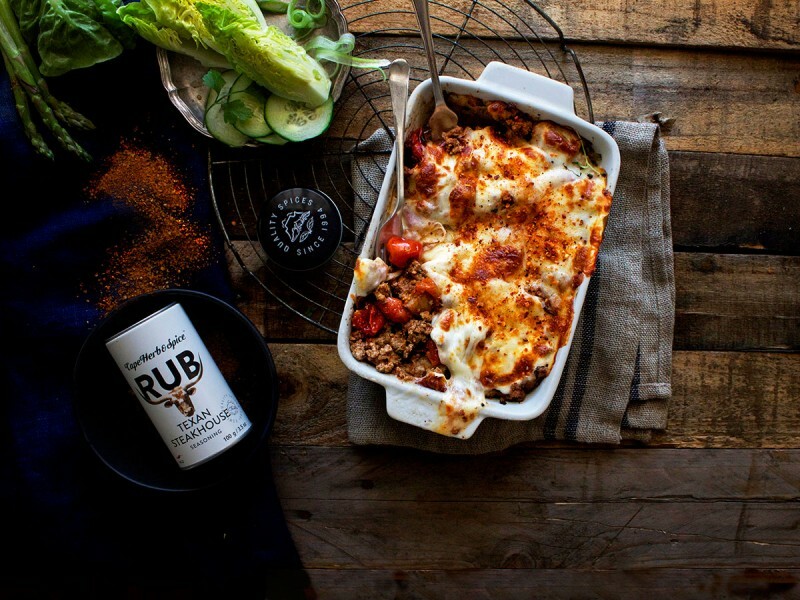 Beef mince gets an intense flavour boost with Cape Herb & Spice’s Texan Steakhouse seasoning, with tinned cherry tomatoes providing a perfect acidic foil for all that beefy richness. Next up are potato hash cubes, fluffy and soft inside and crispy on the outside. The lot gets topped with mozzarella before it goes under a seriously hot grill very briefly. It’s a meal-in-one wonder. All it needs is a crisp green salad on the side. And by green I mean all green, because I just love monochromatic salads. Think quartered baby gem lettuce, cucumber, celery and tender new-season asparagus blanched for just a minute or two before you refresh it in ice water. A dash of vinaigrette and you’re done. Tuck in! Fry the onion in 3 Tbsp olive oil until soft. Turn the heat right up and add the mince. Fry until it starts to brown and caramelize. This browning is important as it lends wonderful umami base flavours to the dish. Add the garlic and Cape Herb & Spice Texan Steakhouse Rub Seasoning and fry for a further minute. Add the tin of tomatoes with liquid. Turn the heat right down and cook low and slow for 30 minutes. Once cooked, stir in the coriander. In the meantime make the hash. Fry the raw potatoe cubes in ghee (clarified butter) until they are soft inside and crispy on the outside. (You could substitute the ghee with olive oil if preferred). Spoon the mince into an ovenproof dish, top with the potato hash and scatter generously with mozzarella. Place under a hot grill for a minute or two until the cheese is melted and browned. Serve immediately with a final sprinkle of Texan Steakhouse Rub Seasoning. Pile the hash in one corner of the dish after it comes out the oven or serve the hash separately if you prefer. Oven-bake large potatoes, cut in half and scoop out some potato flesh. Pile on the Texan Steakhouse mince, scatter over cheese and grill. Lose the potato altogether and add a tin of rinsed red kidney beans to the mince. Top with cheese and in the oven it goes.